If you are looking for simple way that is able to keep you reminded with tasks on hand, here is a tiny utility that you can consider. Named as Sticker Lite, it is a free utility that allows you to write any notes and virtually paste them on your desktop screen as a replacement of conventional paper sticker notes that are not environmental friendly and could be confusing especially when too many of them scattered around on your desk. Once install and launch the utility, Sticker Lite will stay at your system tray ready to be executed. Without any setup required, double clicking on it will launch a new rectangular box that allows any notes to be written. On top of each note, there is indication on date and time so that you aware of when it was created with any brief description of tasks that you would like to jot down. 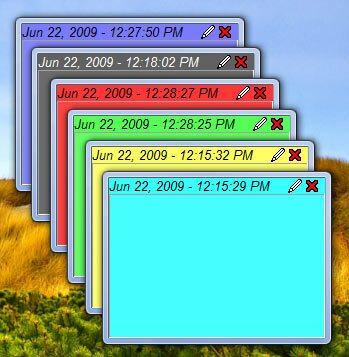 Users are allowed to create up to 10 individual notes (in different colors) with modification or deletion at any time whenever there is no longer needed. In case you need to customize it, right clicking on the icon at system tray will allow users to access properties and default settings for any changes such as Font, background color, transparency, set priority, Hotkeys and many more. Besides, users can import/export the notes and even send the notes to others by right clicking on the note itself with specified IP address or email address of the recipients. Supporting all Windows Operating Systems such as 98, 2000, XP, Vista and even Windows 7 in both 32 and 64-bits, Sticker Lite is free for download for more effective tasks and time management in both home and office environments.